March 2019 fansoun ach sipwene utut won ei anapanapen umuno ika tou seni Muun FSM.. Upwe chok mak non fosun Chuuk pun epwe wor an aramas repwe weweoch me tufichin aneani. Me mwen upwe sopwena met sipwe eani mak , upwe akkom omusomus ren met sipwe makkei ika epwe weires me riaffou netip me ekiek, nge upwe tungor oupwe kan omusano ach tipis. Ewin upwe akkom kapas eis? Pwata iei Former President Manny Mori me Former Vice President Redney Killion ouwa men pochokun won an esap ponueta ei ekiek? Fakkun Tirow womi me ruomon. Esap seni ach asamolungaw me namanam tekia womi. Nge pwata mwo oupwe keran kuna pwe mi chommong met Chuuk epwe osupwang won ika epwe tou seni FSM ika umuno nge ouse chok kuna non ami we emweni FSM non ekkewe ier ika fansoun ami mi momot non office? Met? Ou fori ngeni Chuuk non ami we emweni FSM? Met sokkun pekin development ou fori ngeni Chuuk State non ami kewe fansoun.. Menni ewe PII Construction ? Esap iei ewe company echok tonong tairi ika urumotei ewe al Weno fiti me angawana ekkewe sewer line? An io emwekut me kokot ei? An Chuuk State ika an Manny Mori me BJ Mori? Sii chok ekis tuuta won ei pun ikei wewe ese wor ekiekin me chungun Chuuk non ekkei sokkun Leaders.. Iwe Mwa en Redley, Omw ewe kose make it ngeni ewe President seat , Ina popun iwe ka mochen repwene investigate won moni noun Chuuk State me ekkewe Municipalities, iwe ra osukosuk ekkewe congress me mayors ren... Ika pwe seni ngawen netipemi ami Ouse pachenong non ei angang, iwe ousap fen etipetipa aramas ren. Ouwa Oput Sabino,Kachu me Chuuk State Leaders Ina popun ouwa pwan oput ei ekiek. Pwata Ouse fen anisi ei ekiek ne aweweiochu ngeni aramas met eochun me met ngawan, ousap chok angei epek nge poutano epek. Chechemeni pun aramas repwe fini ika epwe ponueta ika esap ponueta. Sa fakkun peno ren ei No sides against Yes sides..
Tungor ngeni kemi AG Sabino me Chiechiom won ei movement, ika ouse mochen oupwe sopweno nge aweweiochu eochun me ngawan ei ekiek pun aramas repwe weweochuti ei anapanap, oupwe wes me ngeni aramas eochun chok nge nikiti ngawan Ouse pwan ngeni aramas, Ina popun Manny me chon Elvis, Redley chiener Kius Sananap , rese tipe ew ngeni ei movement an Chuuk State. I only have one question for the political status commission. If and if comes 2019 and majority of chuukese voters voted for seperation, and the U.S. says no when we try to negotiate with uncle sam. What will become of the voters decision to seperate from FSM? too much talk, time to put your talk into actions! when chuuk separate from fsm there will be a big celebration from the marshall islands all the way to palau! Nothing will happen as long as the COFA money keeps flowing. 2023, however, might be another story. I heard this in the 80s, 90s, 00s and now 10s. This is retarded. Stop it already. The chuukese separation movement has a ACE up their sleeves. Its China. China is pouring billions of dollors into the pacific to counter US influence. What i fear is chuukese voting yes for separation from the federation and turn to China for funding and money. Some say it is an ACE. Others say it is a JOKER. We shall see. China would spend billions and give billions for a piece of the real estate uncle sam call strategic denial. Truk was once a naval base, the chinese would spend treasures to have port call and naval base in Truk lagoon. With "billions" in Chinese money, Chuuk could become the new Nauru, once the richest country per capita in the Pacific and now one of the poorest per capita in the world. As the U.S. 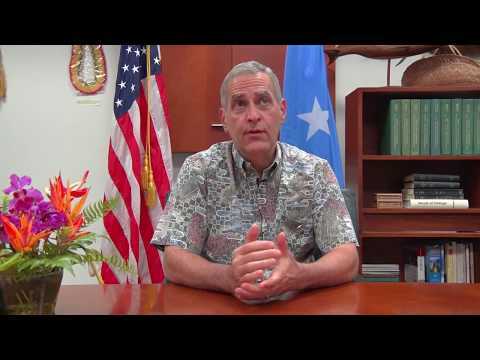 Ambassador warns, the trade off will be no more visa- free access to, or residence in, the U.S. for Chuukese. But maybe China will grant visa-free access to China for all Chuukese. This is not Nauru and in no way is similar to Nauru. Two different issues that are not the same. Will the US allow a piece of its real estate that it consider vital to its national security being patrolled by Chinese warships? I think not. This is the separatists ACE in the hole. In no way will the Pentagon allow China to have this. How exactly would the Pentagon stop Chuuk from declaring independence from the FSM and forming a compact with China? Attack and occupy Chuuk and declare war on China? No chance. Listen to what the U.S. Ambassador to FSM said in the video posted above. The people of Chuuk are free to choose independence.....and then suffer the consequences. Is there a difference between a referendum and a plebiscite? I heard one is non-democratic in comparison to the other. Which is which? Why do people keep connecting Chuuk's Independence and China? And why would Ambassador Riley warn that Chuuk would suffer "the consequences of becoming independent from the FSM?" The only consequences he talked about are the Compact benefits to be interrupted, but the Chuuk Independent Movement is aware of those consequences and is searching for answers and replacements. The Pentagon will not allow this to happen in many ways. If Chuukese decide to vote separation the Pentagon will not have it allow china to have a port in the middle of its strategic denial real estate. 2 ways the Pentagon will make sure it never happens, first it will remind the Whitehouse why china can't have it or second it will interfere in chuuks internal politics. We are seeing number 2 being carried out by US ambassador. Ambassador Riley stated quite clearly that the U.S. has no intention to negotiate any new compacts...not with Chuuk nor with anyone else. Thats his statement but as we know the US can always change its position in regards to its national security. I'm not for the separation but I'm for country, Democratic countries making their own choices. Ambassador Riley agrees with you. He clearly states that Chuukese should make their own decisions....and that they should know the implications and consequences of their decisions. It scares the hell out of me when you said that your Commission is still searching for answers and replacements when US aides is cut off. So, this whole idea of separation is only a "dream"? I for one am not against the movement but after seeing all the misleading information, just to get a "Yes" from the people pissed me off. The commission and its intentions were well taken and understood. As a matter of fact most were in awe of this big move. But the way it was presented and how it is being handled is too much. If their intentions is to intentionally mislead its own people, what would become of them in the future under such leadership? Just sayin....the approach and attitude, not to mention the disrespect from a state AG to an international diplomat, one that may be their key to their success, just shows the lack of diplomatic skills and knowledge of how to run a country that wants independence. Popuse CPSC! Amatures! Nuwen tipajem nge mi pwano tiparojun non jamwer!!!! All of them, popuse! Some posters talks about Chuuk turning to China if US does not respond favorably to its independence move--breaking away from the FSM. Some have said that China can come in to Chuuk for the rescue. Anybody who wants to predict how US will respond to Chuuk's future, whether dealing with China, whether pursing its non-aligned military wishful thinking, etc., I would suggest a quick study of the case of Guantanama Bay which is part of Cuba. Cuba's leadership, starting after the "revolution" until today cannot break the US's hold of Guantanamo. It's my understanding that US took control of Cuba along with Puerto Rico and other places after the American-Spanish War. After Cuba's independence was declared, the US made a lease agreement with the Cuban government. Actually, the US Congress made a law that required the Cuba government to lease or sell Guantanamo Bay to the US as condition of letting it go. The agreement had a clause that is similar to the FSM-US Compact: termination will be by mutual consent--so if the Cubans want to terminate and US says no, then, it's no. That's the same language with the indefinite duration of the Compact for FSM-US. When the Cuba's revolution (Castro, Che, etc.) took over the Cuba government, the new Castro government wanted to kick the US out of Guantanamo Bay. But the US said no. The Cuban government cut water and power to Guantanamo facilities. The US military then built its own water system and power. The Cuban said the lease which the US made with the pre-revolutionary government was invalid; but the US says it was valid. The Cuban government had made a mistake of cashing the first lease payment, which the US says, was a legal acceptance of the lease. So there is nothing that Cuba can do. They complain to the UN and try to all kinds of name-calling. They also fear that if they were to take up arms against the Guantanamo Bay, it will give the US a pretense to invade Cuba and take it over again. So I am just saying that the US appear nice but it can also be nasty and more than firm when it comes to its interest in the world stage. Many countries had learned that; and are now learning more of it under the current administration. In short, the US will not allow Chinese or any hostile country to enter Chuuk because Chuukese, under the UN-observed plebiscite, over 30 years ago agreed to join the FSM; the act willful act of self-determination that allowed the Compact to be put in place. I am not a historian but it is indeed interesting to see how the US government work with its international agreements in pursuit of its interest throughout the world including Micronesia, specifically, the FSM. According to Trump, its America first. Also, Henry Kissinger, former Secretary of State, who is amazingly still alive, once said, "who give a damn" about those few island's natives. marc, you are mistaken about a very important point, namely that the Compact can be terminated only by mutual consent. That is not true. It can be unilaterally terminated by EITHER the FSM or the U.S.
between the Governments of the United States and the Federated States of Micronesia. take place not earlier than three months after delivery of such notice. The plebiscite or other process shall be administered by the Government of the Federated States of Micronesia in accordance with its constitutional and legislative processes. If a majority of the valid ballots cast in the plebiscite or other process favors termination, the Government of the Federated States of Micronesia shall, upon certification of the results of the plebiscite or other process, give notice of termination to the Government of the United States, such termination to be effective on the date specified in such notice but not earlier than three months following the date of delivery of such notice. The time specified in the notice of termination may be extended. FM, I agree, however, the term "mutually agreed" is the clause that gives the US a lot of say on the matter. If the US chose for its own selfish reason to say "no", then, whatever is proposition will not be considered as being mutually agreed to until whatever conditions are met by the FSM's side so as to satisfy the US. And I am sure the US, being "resourceful" with its clout and military and economic might as known throughout the world, it will find legal loophole(s) if it wanted to as in the case of Cuba where the first lease payment to the revolutionary government was the reason the US said the lease to the Guantanamo Bay was valid since it met the elements on a contract--offer and acceptance. Some something like that. If US chose to take a position not to allow the Compacts to be terminated, it will find ways to have its wish. "Mutual agreements" provide one party to dominate the discussion based on its interest; and I am sure the US proposed such language to be inserted in the Compacts for its purpose. I am not being negative. I am glad for this discussion of the "mutual agreement" provisions as being discussed here because it has a lot of legal and practical implications. You, being an attorney, are in the position to find the wiggle room out of the "mutually agreed to" clause in agreements, I am sure. But that will be up to the US attorneys to say that they agree or not; and as long as they don't agree, then, it does not meet the test of "mutual agreement". I am not disagreeing with you. I am just cynical about the meaning of the "mutually agreed" clause of the various agreements. marc, I am not an attorney, just someone educated enough to read and understand the Compact. The Compact clearly lists the three ways in which it can be terminated: 1) Mutual agreement by both countries; 2) Unilateral termination by the U.S.; 3) Unilateral termination by the FSM. It is called the Compact of FREE Association for a reason, namely that either country can freely withdraw if it so chooses. We should not assume that the U.S. will never allow a Compact termination. The current U.S. president has withdrawn his country from the Paris Climate Accords and from the Iran Nuclear Weapons Agreement, and he has even threatened to withdraw from NATO. So anything is possible, my friend. I believe Chuuk has a chance of having its own COFA if it moves out of the federation. Has mentioned on many occasions in here the US is repositioning its foriegn policy to counter a growing China. In the next coming decades the US will focus on the Pacific. If the commission is smart it will used this to its advantage in negotiations for a cofa like agreement with the US. America will not stand by and let hundred thousands of square miles of oceans and islands of Chuuk fall into China's sphere of influence. It will negate the entire strategic denial basis of the cofa. Deny other powers from having these is the entire reason of the COFA. Will America let china have hundred of unsinkable carriers between it and Guam? It won't. The paris agreement and the iran deal weren't for ever since both weren't agreed and signed off by the US Congress and weren't made US laws like the COFA is. That's the different between COFA and paris and iran deals. The two laters were purely taken on the initiative of the Executive, not the law making body of the US government. Would the US Congress let china have a beachhead in its strategic denial? Again no. I'm not for Chuuk separating but im for democracy. If this is what chuukese want then so be it. If chuuks commission gets what they want then they will use these to their advantage in negotiating for their own COFA. The upper house of the US Congress will be dominated by republicans for the next 7 years. And republicans are always for strong defense and they will not allow chuuk to fall into China's sphere of influence or allow a part of their COFA strategic denial have a hole in it. China could have "hundreds of unsinkable carriers?" Like Japan had when it controlled Micronesia? And how did that work out for Japan? And for Micronesians?